An island in the northern part of the Adriatic coast of Croatia. It is primarily a mainstream, beach holiday sort of destination, but it is covered here as well for two main reasons: a) it was the location of an Italian concentration camp during WWII, which today is commemorated by a sombre memorial site, and b) it is the jumping-off point for boats to Goli Otok, the Yugoslav “Gulag” island. More background info: Rab is a mid-size island by Croatian standards, smaller than Krk (I just love that vowel-less name!) but much bigger than, say, its grim neighbour Goli Otok. It's roughly shaped like a wrench/spanner, with a long “handle” in the south and widening in the north with two deep bays giving it its claw-like appearance. In total the island is ca. 14 miles (22 km) long. 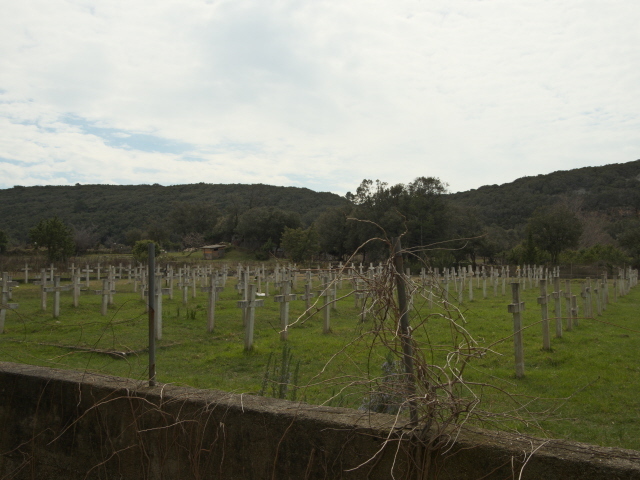 The topography is characterized by a stark contrast between the barren karst of the eastern side and the much greener western and northern parts. The Dundo peninsula, the westernmost section of the island, is even covered in old-growth oak forest. Except for Lopar in the far north, all settlements are on the western side of the island, including the largest town and “capital”, which is also called Rab (see combinations below). The island has a permanent population of ca. 10,000, but this swells significantly in the high season, when it is full of tourists. Rab has quite an ancient history and was part of the Roman Empire, falling into the hands of Venice in the late Middle Ages and from the early 19th century became part of the Habsburg Empire. It remained under the control of Austria until the end of WW1 in 1918. From 1921 it was part of what was to become the Kingdom of Yugoslavia. An interesting aside: the founder of the micro-nation San Marino was from Rab, and the town of Rab is twinned with San Marino, plus there is a part of Lopar bearing the name San Marino too. In WWII, when the lands of present-day Croatia were occupied by Nazi Germany and fascist Italy, much of the Adriatic coast and its islands, including Rab, were seized by Italy (while the newly formed “Independent State of Croatia”, a Nazi puppet state, remained mostly landlocked). And this is where the dark connection comes in. The Italians established a concentration camp on Rab, near the village of Kampor in the north-western part of the island (hence it is also known as 'Kampor concentration camp'). The camp was in operation from mid-1942 until September 1943. Up to 15,000 inmates were held there at the height of its use. At least some 1500 did not survive.That's the number of victims whose names are on record. But in total the number may well have been much higher. Estimates range up to 4500. The largest group of victims were Slovenes, deported here from their homelands ('ethnic cleansing'!) to weaken the partisans in Italian-occupied Slovenia. Inmates were mostly housed in simple army tents – six each in tents meant for two occupants, with only one blanket to share. In the cold winter this was obviously inadequate – and so were the sanitary conditions (just a basic latrine), the daily provisions of food (only half the calories required for survival) and drinking water (just one barrel of water for all inmates). Yet Tito's Yugoslav communist organization (later to become Yugoslavia's single party) was active in the camp, keeping up some degree of morale. After Italy's capitulation to the Allies in September 1943, the inmates managed to free themselves and disarm the Italian guards. Most ex-prisoners went on to join Tito's partisans. As early as in 1953, a memorial was set up at the camp's former site/cemetery. Ironically labourers of the nearby prison island Goli Otok are said to have been used in the work on the site. (An unsavoury aside: Camp Rab/Kampor was a concentration camp, an Italian one – and for most of the inmates it wasn't a picnic. It was thus noted with disgrace when in 2003 (in an interview with Boris Johnson) Silvio Berlusconi, in one of his typical gaffes, said that Mussolini only sent people on enforced "holiday" to Rab.). By the time the memorial was first set up, Rab, like the rest of Croatia, had become part of the Socialist Federation of Yugoslavia. This remained so until Croatia gained independence in 1991. The Balkans Wars that ensued with the break-up of Yugoslavia in the 1990s seem to have largely passed Rab by (I've so far not seen any references to the Croatian “Homeland War” in connection to Rab – correct me if I'm wrong, by contacting me). But I presume that the tourism industry must have been badly affected. These days, however, the island lives primarily off tourism again. It is especially popular with holidaymakers from Germany, hence German has become almost a kind of unofficial lingua franca on Rab. The locals are much more likely to converse in German than in English. One special aspect of tourism Rab is known for is nudism! Apparently this was pioneered in the mid-1930s by none less than the British King Edward VIII and his American lover Mrs Wallis Simpson (for whom he later abdicated, so he could marry her). These days it's, again, mostly German nudists who frequent the specially marked nudie beaches. These are marked by the letters “FKK”, which is short for “Freikörperkultur” and translates literally as 'free body culture' (but really means nudism). But tourism also has all manner of other forms here, including nature tourism (in the literal sense, not as “naturism”, which is just another word for nudism), especially in the wooded western parts, cultural heritage tourism, especially in the old walled town of Rab, and of course maritime tourism, i.e. holidaying on a boat, which is very popular all over the Adriatic. What there is to see: For the dark tourist the prime site to visit on Rab itself is the memorial for the Italian concentration camp from 1942-43 near Kampor. It's a sombre place, though there isn't that much to see. It felt quite forlorn – there were no other visitors the whole time I was there. There are two information panels by the entrance that provide some basic historical information (in five languages: Croatian, Slovenian, Italian, German and English) as well as some photos, including historic photos of the camp as it was in 1942 and 1943, plus a map/plan of the camp. There is also an additional memorial plaque put up by Slovenia (this one is only in three languages: Slovenian/Serbo-Croat, English and Italian). Through the metal door you come to a kind of open-air “atrium” with some symbolic columns, an urn and a stone bench. Proceeding further you come to the main cemetery part of the memorial. 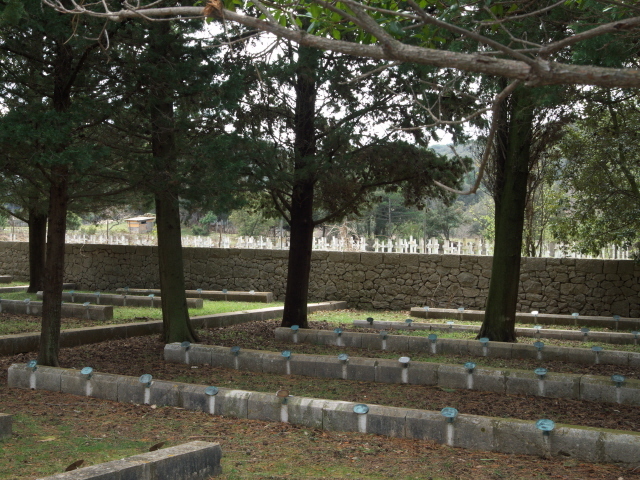 There are different sections, with a total of just over a thousand graves. There's a separate oval-shaped section for the very first 19 victims, as well as a separate monument for the Jewish battalion of partisans formed from survivors (see above). At the centre of the site stands a tall stone obelisk and beneath it is a long metal panel into which the names and birth years of almost 1500 known victims are engraved. 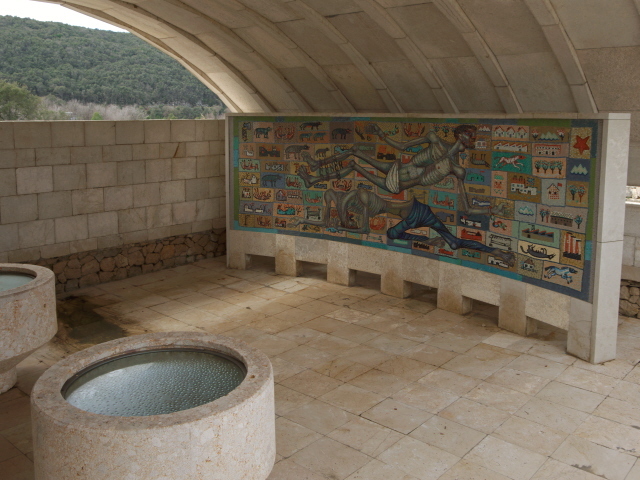 At the far northern end of the complex is a semi-separate memorial with a rounded stone roof (symbolically recalling the tents that victims were housed in – see above) under which is a large colourful but grim mosaic by a Slovenian artist, as well as two round stone tubs with glass tops. Inside are said to be fragments of burnt camp barracks, but the glass was so full of condensation that hardly anything could be seen through the water drops when I was there (in early April 2018). In a field directly adjacent to the memorial is another cemetery, filled with simple crosses like at a war cemetery, which it may well be. There was no information about this, though, so I don't know whether it has anything to do with the Kampor camp or not. While this memorial site is the main site for dark tourists to visit on Rab, the principal reason for coming here will be that it is from Rab, more precisely the northern harbour town of Lopar, that you can get boats to Goli Otok (see combinations). But there are also a couple more things on Rab itself that may be worth mentioning. One is a striking WWII monument by the roadside near the village of Supetarska Draga. Or at least I think it's a war memorial, because it has the years 1941-1945 on it plus some names (massacred partisans, maybe?) plus something about “fascist terror”. Otherwise the monument consists of a curved stone wall with two barred window holes set into it and a column standing in front of this that's crowned with the Yugoslav five-point star. Another monument of note is just outside the Old Town of Rab (see below), namely a flamboyant partisan statue with a rifle in one hand and a hand grenade ready to be thrown in the other. On the town hall is also a partisans-related plaque. Location: in the northern part of the Adriatic coast of Croatia in a cluster of islands (including Goli Otok) close to the mainland, south of the larger island of Krk and north of Pag, about a hundred miles (160 km) south-west of Zagreb (as the crow flies). Access and costs: fairly easy by car; can be quite affordable. Details: To get to Rab you really need a car. In theory you can get to Rab by ferry as a foot passenger too, but for onward travel, especially also to get to the Kampor camp memorial, you need some form of private transport, i.e. a car or bike. There is a year-round ferry service plying the strait between the southern end of Rab at Mišnjak and the mainland. There it used to depart from Jablanac, but since 2012 the embarkation has been moved to a new terminal at Stinica, about a mile (1.6 km) further north. It's only a short distance from the main north-south coastal route E65. There are multiple crossings every day, more frequently in summer, but at least every two hours out of season, usually departing at half past the hour. Be there sufficiently early to have time to go to the ticket booth (you don't pay sitting in your car). The fare I paid in early April was 85 HRK for the car, plus 15 HRK for each person in the car (the driver is not included in the car fare!). The prices may be higher in the summer season. In high season there is also another car ferry operating out of Krk (from Valbiska) that goes to Lopar in the north of Rab, but given the fact that the distance across the sea is much greater on that route it's also likely to be more expensive. To get to the Kampor concentration camp memorial drive up the island's main route (105) until you get to Rab town, and keep left to turn into Banjol and onwards in the direction of Kampor. The memorial site as such is not signposted in Rab (or at least I never spotted any signs). It's only when you get to the turn-off in Kampor (a short distance past the hospital) that a brown sign appears pointing left saying “Spomen gr.” together with a cemetery symbol (white square with three black crosses in it). The memorial is 200 yards down the track. There's only limited parking, but you won't find many other visitors at this spot most of the time, so that shouldn't be an issue. Boats to Goli Otok are best found in Lopar in the far north of Rab. The marina is practically at the end of the road. When you get to Lopar take the last exit of the roundabout to turn right and keep driving all the way through the town, up the hill, past the San Marino hotel complex and turn left for the road to the harbour. Out of season you can park there. In season I presume you'll have to use some of the paid parking in town. The roadside war memorial monument is on the right-hand side of the main road heading north, a bit under 3 miles (4.6 km) from Rab en route to Lopar, just before the road turns sharply right at Supetarska Draga. 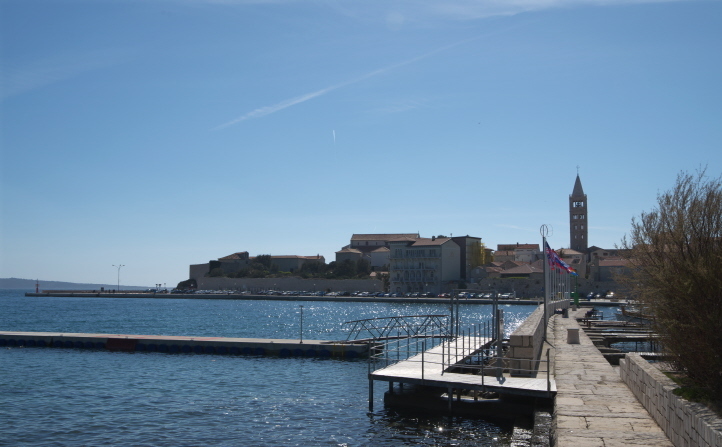 The partisan monument in Rab is at the north-western corner of the harbour near the north-eastern end of the Old Town, by a small park. Parking in the centre of Rab is limited, and usually requires a fee. For staying on Rab there is a wide range of accommodation options. Holiday apartments are the most numerous, and many of these, as well as some pensions, operate out of season too. Most of the bigger hotels (mainly located in Rab and Lopar), on the other hand, seem to be only open seasonally (from May). For food & drink there are plenty of restaurants in Rab, and a few elsewhere too, e.g. in Lopar, and if you have a self-catering apartment you can stock up on supplies easily in one of the several supermarkets. You can tell that the infrastructure is geared towards much larger numbers of people than I encountered off season … But the supermarkets and most of the restaurants are open year-round. Time required: One day should be set aside for Goli Otok alone. And the Old Town of Rab deserves perhaps half a day too. Visiting the Kampor concentration camp memorial doesn't take long, maybe half an hour (plus getting there). So in total you'd need two days. I allowed three to have more flexibility in organizing the boat to Goli Otok, and that paid off, especially as it was Easter (in these Catholic parts such holy holidays are observed!). Combinations with other dark destinations: Most obviously Goli Otok, which is actually the single best reason for coming to Rab in the first place, from a dark-tourism perspective. Combinations with non-dark destinations: Rab is primarily a mainstream, seaside and maritime holiday destination, with all that usually comes with this. Including nudist beaches (see above). Going by all the tourist infrastructure it must get pretty crowded here in the high season. But it's not all just about sea, sun and beaches. The Old Town of Rab is also a historical heritage site. The town is ancient, dating back to pre-Roman times. It's a walled warren of narrow passageways and stairways, with several old churches and a generally splendid olde-worlde atmosphere (at least out of season – when the place is crawling with tourists in the summer that may be different). It's a bit like a mini-Dubrovnik, minus the cruise ships and Disneyfication that this more famous coastal town down in Dalmatia so suffers from. The island of Rab also offers nature lovers and hikers something, especially in the western old-growth oak forest or the coastal topography north of Lopar. See also under Croatia in general.